I gave 2 cable TV interviews and a local newspaper interview because of the prisoner stories that were displayed, and I spoke about Rudy Howell's case to demonstrate the corruption, lunacy and brutal sentencing laws and policies. It was good to have Rudy's poster right there showing a real person with his mother, and emphasizing his humanity and the injustice of the drug laws. I handed out a one page with drug war facts and November's website ... LOTS of people showed up for the protest ... OC NORML had contacted a band named 'MARIJUANA' and apparently they ran an ad in a local newspaper or magazine promising free herb at the protest ... so in addition to the 50 - 60 people who showed up, there were 5 police cars with 10 officers surrounding us for the first hour and a police helicopter flew overhead. I was told that I'd be notified when the shows with my interviews go on the air ... that's about it .. oh, we have photos .... it was a very good day! P.S. - I need to add that it was GREAT to have Judge [James] Gray at the protest - he openly opposes the drug war and he is running for US Senate against Barbara Boxer. Judge Gray has a book out: "Why Our Drug Laws Have Failed And What We Can Do About It -- A Judicial Indictment of the War on Drugs", published by Temple University Press. If you are in California, please consider Judge Gray for US Senate. 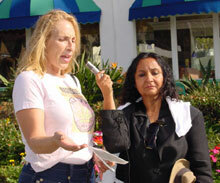 We had a fantastic event in Laguna Beach last Saturday. Day long attendance approached 100 people, while over a thousand pedestrians saw our signs and hundreds intermingled with sign holders (many wanted souvenir pictures). Multiple traffic signals slow vehicles at our Main Beach location (slower/stopped cars have time to read our signs) The traffic count estimates were over 10,000 vehicles during the four-hour event (we ran an hour over schedule). Thousands honked in support/gave "thumbs up" gestures and were very supportive. Our rallies are joint efforts with The November Coalition. They are working to end drug war injustice and to warn the public about the increase of incarceration rates due to the war on drugs. Their wall of shame presents photos of drug war victims often with their families, their offence, and length of incarceration. The Press attended. 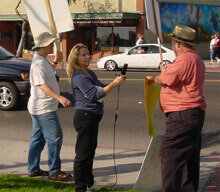 We gave interviews for two cable TV shows and The Daily Pilot Newspaper. Marijuana the Band attended. They arrived with many of their supporters and added to our popularity. Drum circle people attended. They created a festive atmosphere for the rally and encouraged pedestrians to intermingle. Judge Jim Gray attended. 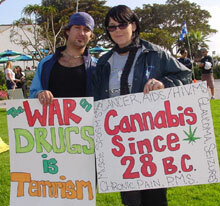 As Libertarian candidate for US Senate, he supports a staunch anti drug war platform. For everyone who attended. A heart felt thanks. For those whose schedules conflicted with the event, we thank you for your support. Click Here for more on Rachel Morton's activism.